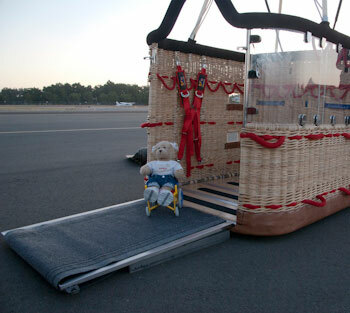 Cherrie getting ready for her ride in America's first wheelchair-accessible balloon. At first glance, it doesn’t appear that hot air ballooning is a good choice for wheelchair-users. But Cherrie likes to try new things, so I’m thrilled that we found a hot air balloon operator in Sonoma County that recently added a wheelchair-accessible balloon to his fleet. And Cherrie was thrilled to be one of his first passengers.We arrived at the Santa Rosa airport early and watched them set up the balloon. It’s a long — but interesting — process. After they unroll the balloon (called the envelope) on the tarmac, they use a fan to push in cool air. Then once it’s full, they heat up the air and the envelope rises off the ground. Then it’s time to hop in and take off — which was easy for Cherrie because one side of the basket (called the gondola) folded down to create a ramp, so she just rolled right in. Then up we went! The great thing about this wheelchair-accessible balloon is that there is a clear partition on one side of the gondola, so even someone seated in a wheelchair can see out. This is very important because the gondola is higher than the wheelchair, and without the clear partition, a person in the wheelchair wouldn’t be able to see the countryside below. And that’s the coolest part of riding in a balloon. After we landed, we were treated to a hearty breakfast and had a chance to visit with the crew. Cherrie was thrilled to ride in the first wheelchair-accessible balloon in America, and hopes that other balloon operators will follow suit when it comes time to purchase a new balloon! Cherrie is also happy that Miss Urry’s class in Wellington, New Zealand came along with her — through this blog — on her ballooning adventure. She’s looking very forward to meeting the kids, as well as Cookie bear in person in November! This entry was posted in Traveling Cherrie and tagged accessible travel, baloon, barrier-free travel, disabled travel, sonoma, travel, wheelchair by Candy B. Harrington. Bookmark the permalink.